Questions remain regarding the origin of a mysterious box on a utility pole in Phoenix. “I think it was a surveillance box… a camera,” said Brian Clegg, who alerted Salt River Project power company to the box on the utility pole. Clegg described tinted windows on the box, which he believes allowed for surveillance cameras inside. An SRP representative told Phoenix-based KNXV that no one had permission to put the box on their pole. Clegg has video of what he described as an SRP crew removing the box late last month. The box was facing Clegg’s house, a strip mall and a high school. SRP said there were indications that law enforcement was connected to the box, but did not elaborate. A mysterious box removed from a power pole in Phoenix last week may have been a police surveillance camera, but Salt River Project won’t go into detail about it. Phoenix resident Brian Clegg alerted New Times to the weird “black box” in an e-mail last week and sent along the photograph seen above. As the picture shows, the device was a gray box with the number “208” and a clear strip near the bottom that may be a window for a camera. Clegg says it also had two oval windows on each side. Clegg also called SRP about it. 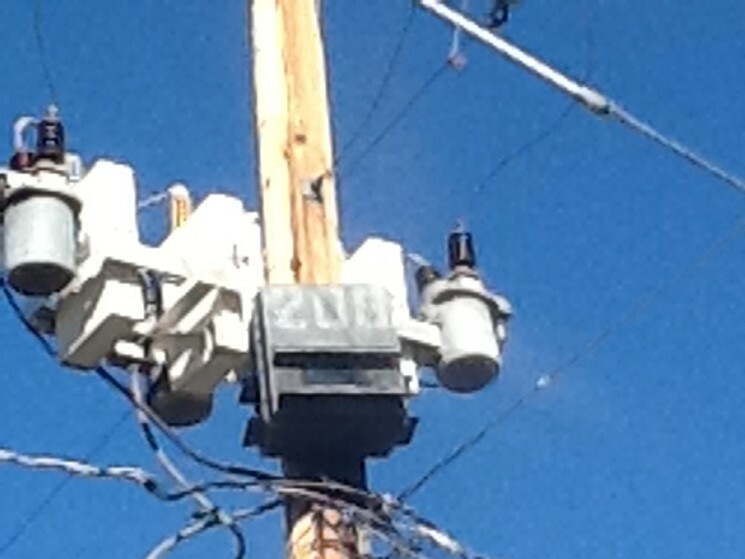 He first noticed the device on March 23, after he saw the truck that installed it on a power pole in the alley behind his home in the 2100 block of West Glendale Avenue. Clegg says on that day, he spotted a new-looking, white utility truck with a hydraulic boom and basket attached in the alley. An apparent company name, “Field Pros,” was written on the side of the truck. When Clegg, who describes himself as a former utility construction manager, says that when he walked into the alley to find out what the truck was doing, its driver drove away. That’s when he noticed the newly installed device high up on the power pole. Believing it was “dangerously close” to the electric lines, Clegg called SRP to report it. An SRP employee who responded to the call came out when he wasn’t home and told his mother the device was “related to the police department” but was not harmful. He would not elaborate. Clegg called Phoenix police, who told him they didn’t know anything about it. ← THE JEWISH HOUSE OF ROTHSCHILD CONTROLS THE ECONOMY & POLITICS OF AMERICA!